It's a bird, it's a plane, it's a ... meteor rock? 60, of Fairview Heights, in a lot near her home. Nancy Rettinghouse had some of her family over to watch the Super Bowl on Sunday night but she ended up watching a much brighter spectacle. "I was sitting in my kitchen, watching the Super Bowl," she said. "Out in the back lot I saw a big yellow flaming thing falling straight down. I yelled and everyone asked what happened." When she told them she thought she had seen a meteor fall into a nearby vacant lot, no one believed her. "They said, 'Oh, Mom, it was just a light.' But I saw what I saw," said Rettinghouse, 60, of Fairview Heights. That happened about 8 p.m., she said. When they watched the television news at 10 p.m. she heard about many reports about bright lights in the sky from area residents. Most authorities think it was a minor meteor shower. "So my husband went over to look around this morning and he found this odd rock," she said. "We'd sure like to know what it was." 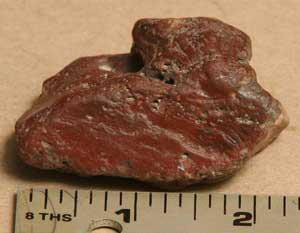 The reddish rock her husband found is about 2.25 inches long by 1.5 inches wide and an inch tall. It was embedded about one-half inch in the ground of the lot, which usually is a garden. There are lots of meteorite identification sites on the Internet. Several have categories labeled meteorites and meteorwrongs, catch words for real meteorites or deceptive Earth rocks. Perhaps the best Web site is www.meteorites.wustl.edu by Randy Korotev of the Department of Earth and Planetary Sciences at Washington University in St. Louis. Any rock coming through the atmosphere would be melted on the outside by the intense heat, showing signs of what they call a fusion crust. Meteorites usually contain metals that will attract a magnet although that is not always the case. Their rock had neither of those things. "I did see something fall in the lot," she said. There appeared to be nothing else on the lot. But perspective can be a confusing thing. The view out the kitchen window is to the west and the last few feet of the view of the lot is obscured by a 6-foot-tall fence which stands about 100 feet away. "I don't want anyone to think we were drinking or something," Rettinghouse said. "It sure will be embarrassing if it's not real. We just want to know." She said they probably will take the rock to someone who is an expert to have it identified. © 2007 Belleville News-Democrat and wire service sources. All Rights Reserved.